VBA Load combobox from xls and fill a second combobox according to the selection in the first combobox. Note that since we need to know which teacher was chosen in Combobox1 we have to "store" the teacher's ID along with the Name in the first combobox. If your doing this in VB, use the combobox's ItemData property instead. VBA Combos don't have this property so we'll put the ID and the name as two columns in the combobox and make the width of the ID column equal to 0 so that it won't show. Also, to load more than one column into a combobox you have to set the list property of the combo to an array, and to accommodate for a list with any number of rows we will build a Dynamic Array, and since you can only change the size of the last element of a dynamic array the rows will be the second dimension of the array and the columns will be a constant 2 as the first dimention. We'll then invert the array by transfering it to a second array where the rows are the first dimension because this is how to get the data into the combo as the rows and columns we want. Run this Macro to put a demo list of teachers and students on Sheet 3. If you dont know how to run a macro go here and then come back. After you see how everything works you can hide Sheet 3 from the Format > Sheets > Hide/UnHide menu. 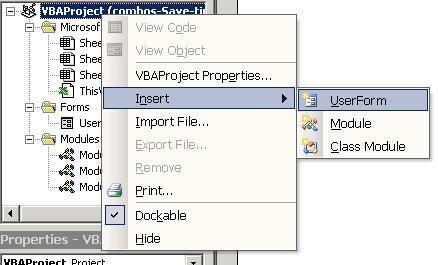 Create a UserForm by Right-clicking on anything in the VBAProject explorer and choosing UserForm. Loop Until strValue = ""
If Range("A" & intRow) = "" Then 'find the first blank row. While testing, you can run the form by double-clicking on it to open the Code Pane (View Code) and then pressing F5 or clicking Run (the green triangle icon). You can also set Breakpoints on any rows by pressing F9 or clicing in the left grey margin. Code execution will stop at a Breakpoint and you can continue from there line by line with F8, stop the code by clicking the square to the right of the run button, or Run the code to completion or the next Breakpoint with F5.